The rare final state of this charming copper engraved map of North America based on the Paolo Forlani map. The continent depicts the vastly elongated extension of the eastern seaboard, the Strait of Anian, a rather odd bulge in the California peninsula and Giapan (Japan) just offshore. The map is decorated with a strapwork title cartouche, compass rose and two wild-looking sea creatures. 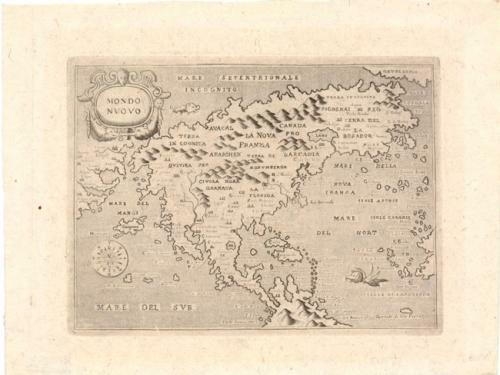 This state was printed without text by Pietro Antonio Brigonci. The plate has been retouched so that the main nomenclature and mountain ranges appear darker. In very good condition - remnants of hinge tape on verso. Ref: Burden #42; Manasek #35.